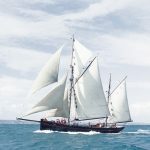 Leader was built in 1892 for William Robbens by the yard of A W Gibbs at Galmpton Creek on the River Dart, just two miles across the hill from Brixham. 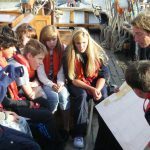 She cost him �1,100, which he raised by means of a mortgage, provided by Robert Hellyer, a Brixham man who had moved to the East Coast in the 1850’s. He and his brother Charles were two of the greatest fishing magnates of their day, each owning a sizeable fleet of trawlers. It is believed that Robbens had skippered one of Hellyer’s smacks for a number of years, and his employer lent him the money to acquire his own boat. She was one of the “big ketches”, a design developed from the original Brixham cutters of the early 19th century. The cutter-rigged boats were known in Devon as “Mumble Bees”, ketches of up to 40 tons were “mules” and those over that size were “ketches” or even, perversely, “sloops”. Leader represented the pinnacle of the evolution of the sailing trawler. A few weeks after leaving the Dart on her maiden voyage Leader put to sea on her first fishing trip. 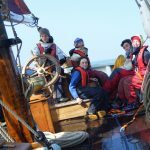 The ship’s papers, still on record, show that her skipper and first mate worked for a share of the profits. The first hand got 17 shillings (70 pence) a week, which was paid to his wife. The second hand got 13 shillings (65 pence) a week, paid to himself, and the Boy had 10 shillings (50 pence), paid to his mother. 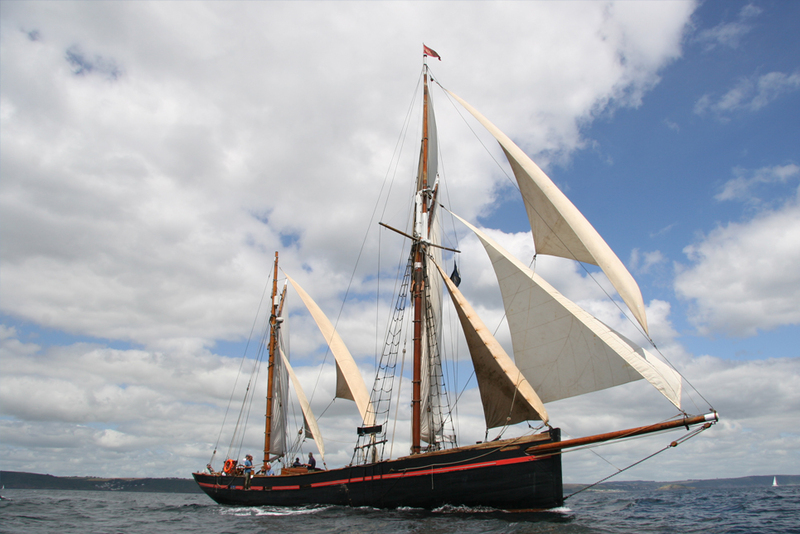 Leader was taken to Scandinavia in 1907 where she continued to fish under sail until 1927, when her first engine was installed. In the 1940s and 50s she was used to carry cargo under power, but was abandoned when this became uneconomical. 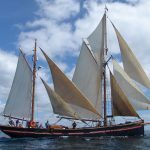 In the 1960s she was sold to the Swedish Sail Training Association who restored her to sailing condition and fitted her out to take up to 24 trainees on offshore voyages. 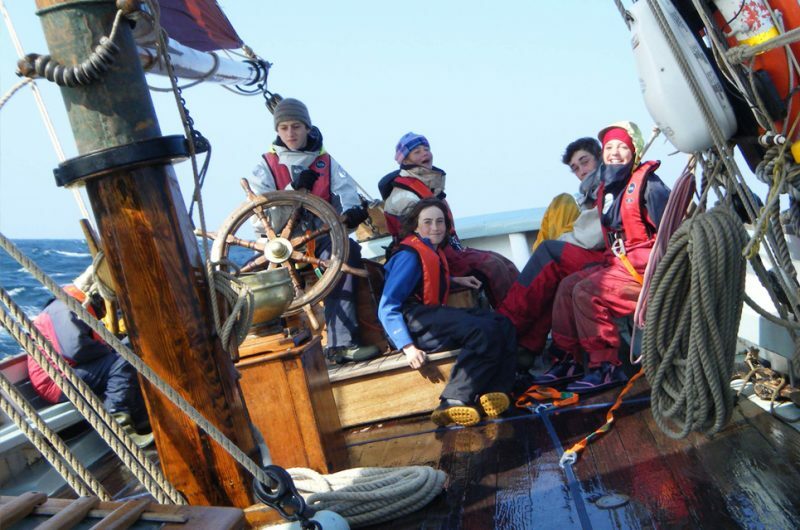 In 1985 she returned to the UK, but to the West Coast of Scotland, where she was based at Ardfern on the shores of the Firth of Lorne and sailed the islands of the Inner and Outer Hebrides on charter for more than ten years. 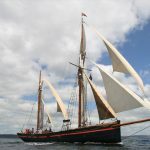 In 1996 she was brought home to South Devon, and operated from Dartmouth until 1999, when she became part of the Trinity fleet, and returned to Brixham. 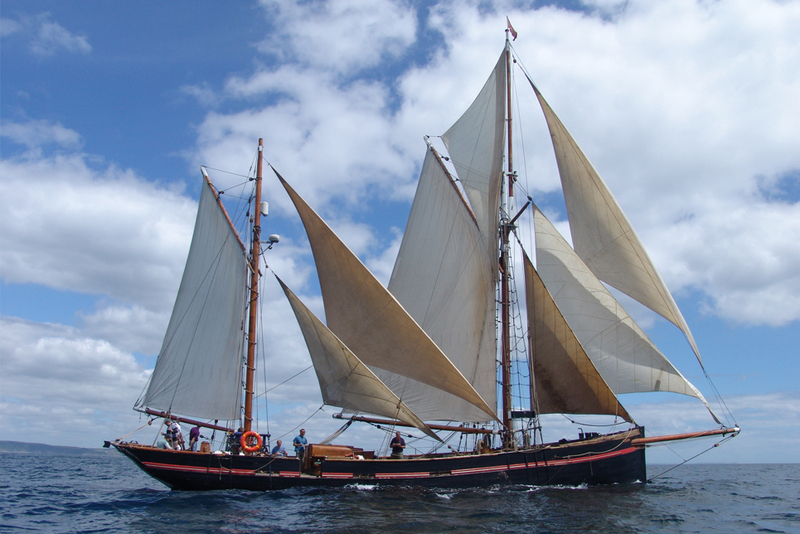 Leader is rigged as she would have been when first built, as a gaff ketch. She is 80′ (24m) long on deck, and 105′ (32m) overall. She displaces about 110 tonnes in sailing trim. She has a beam of 19’6" (5.9m) and a draft of 10′ (3m). 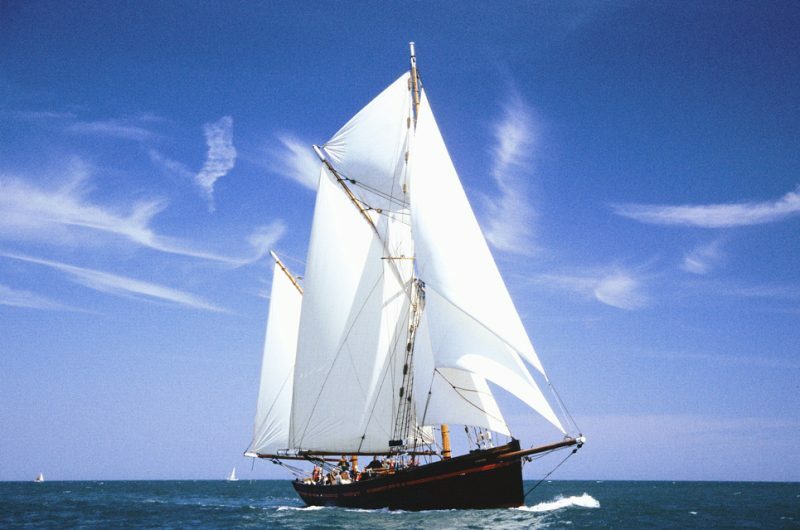 Leader represents the Brixham design at its peak. 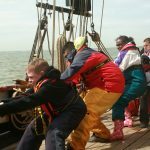 Down below, Leader has been fitted out for her modern role. 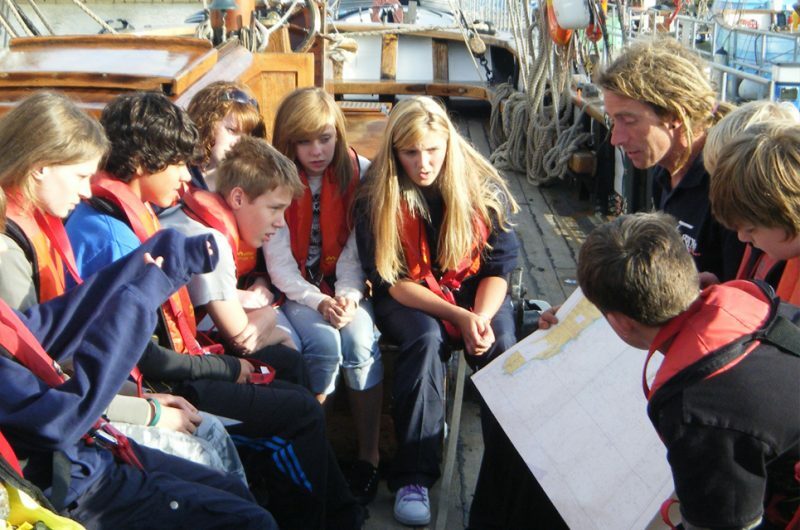 She has accommodation for twelve trainees and five crew, a large saloon area, a galley, showers, heads a generator that supplies a ring main with 240v electricity and a well equipped nav station with modern navigation equipment including Radar, GPS and DSC VHF Radio. 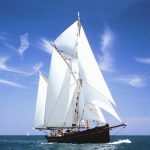 Trinity Sailing operates three traditional Brixham sailing vessels, Leader, Provident and Golden Vanity. Leader is the largest, and oldest, of the three vessels, all of which were built on the Dart river at Galmpton. 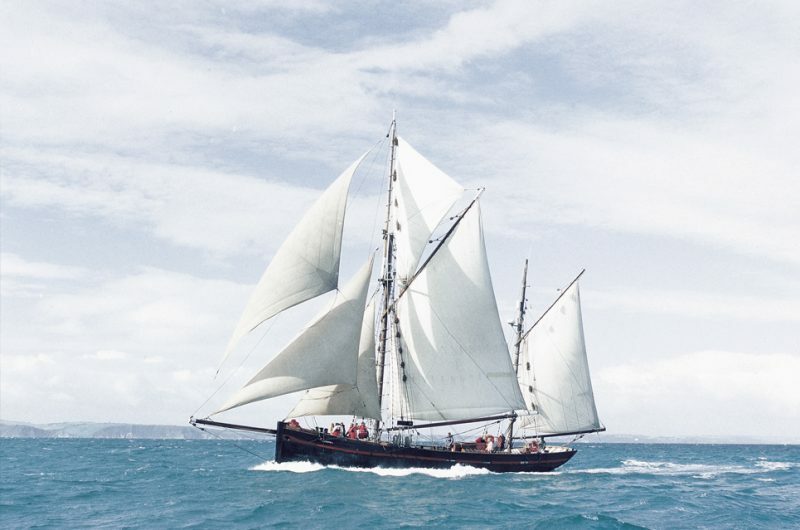 Leader and Provident are two of the last working sailing trawlers still afloat. 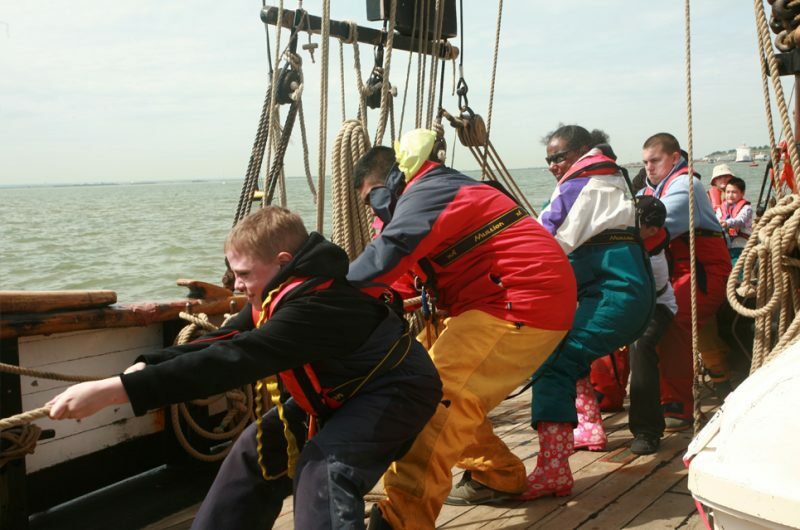 All of Trinity’s vessels have taken part in the Tall Ships’ Races and continue to undertake sail training.